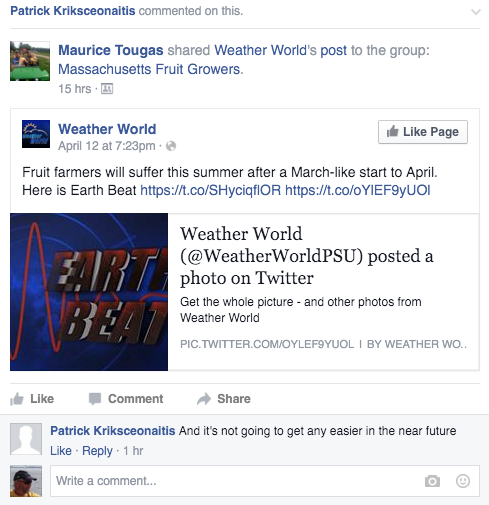 • This will be an abbreviated Healthy Fruit focusing on the primary disease issue (apple scab) that may be of concern. 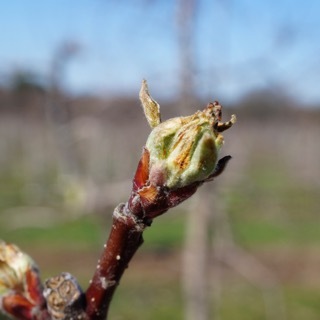 But, I'd be very careful about applying oil given the extent of bud damage from freezing temperatures. What a difficult spring it has been! The weather and winter moth have not been behaving according to plan. 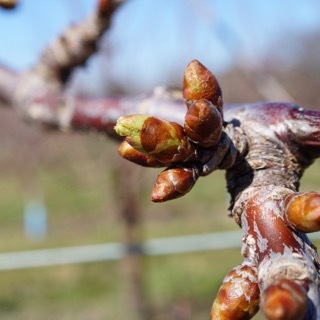 The more normal weather forecasted for the next several days will expand fruit buds and most likely make it possible to reach winter moth caterpillars that are now inside buds or maybe still hatching. The cold conditions really slowed down egg hatch making everything very confusing. And then there has been a lot of rain, and a lot of snow! 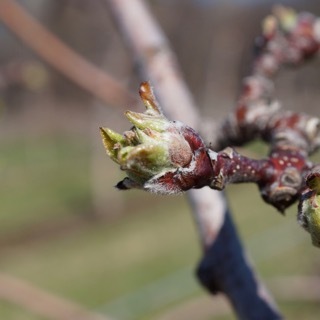 Once blueberry and apple buds are at the tight cluster bud stage (see attached photos), it is possible to reach caterpillars with an insecticide. Since caterpillars are now feeding you can use a Bt product such as DiPel which kills only caterpillars. You can also use a spinosad (Entrust, Captain Jack's Deadbug Brew), Imidan (commercial growers only), Malathion, Sevin, and other insecticides. Here are this week’s numbers, short and sweet. The squash mounts continue to progress coming in at 22.7% up significantly from last week’s 6.3%. In the Petri plate assay we caught 10 ascospores and in the funnel trap (figure 1) we counted 28 ascospores. 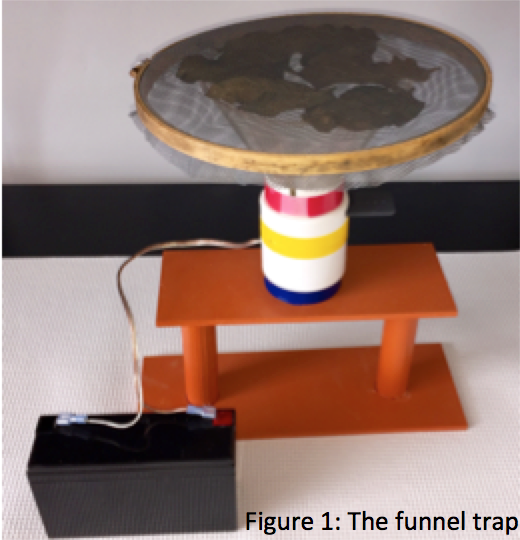 This week the big news is our first official in-orchard spore capture: a whopping two ascospores in the two-fan trap! 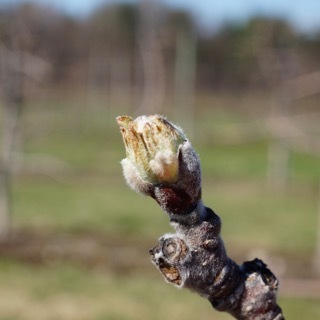 Taking into consideration the more seasonal temperatures we are experiencing and subsequently expanding targets, the growing apple leaves, the next rain event we have is on track to be our first proper infection event of the season, especially with a predicted high of 72° predicted in Belchertown this Sunday. The good news is, if the forecast holds - a big IF these days - that rain is a ways off. Right now there is some rain predicted for next Tuesday, April 19. However, it is short in duration and right now is predicted to start at night. RIMpro and NEWA are predicting no scab infection. So, good news! You have about a week to get all that leaf chopping done. This year’s weather leaves a lot of questions regarding spraying for scab and applying copper for fire blight management. Copper and some fungicides can stress trees, and trees have already been stressed and damaged by cold weather. There are no clear answers, but here are some things to consider when deciding whether and what to spray this coming week. Copper. In blocks where fire blight has been a problem, a copper application will reduce risk of the disease this year. If an application hasn’t been made yet, the window of opportunity is closing fast if it already hasn’t slammed shut. 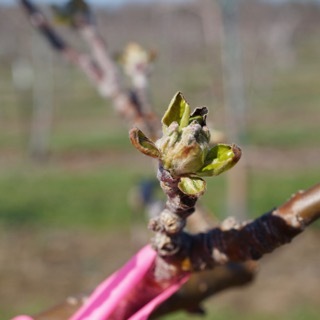 Warm temperatures will drive bud development, and copper applied after ¼ inch green may russet fruit. The risk goes up as buds go to ½ inch green and tight cluster. Any cold damage may increase the chance that copper will get into leaf tissue, causing more damage. To minimize the chance of damage and still provide some fire blight control, use lower rates of copper. Copper products usually have a wide range of rates for each product. For example, Kocide 2000 recommends 6 to 12 lb./acre. Go with the lower rate for the product being sprayed. With no rain predicted for the next week, lower rates should be effective. Apply copper to dry foliage, at a time when it will be able to dry. The longer the drying time, the higher the risk of copper damage. Fixed coppers are less soluble in water and so they are released more slowly and in lower concentrations than copper sulfates. This is good. Most copper products are fixed coppers, including basic copper sulfate, just to confuse the issue. Fixed coppers include basic copper sulfate (e.g., Cuprofix Ultra Disperss, Basic Copper Sulfate), copper hydroxide (e.g., Kocide, Champ), copper oxychloride sulfate (e.g., COCS), and copper ions linked to fatty acids or other organic molecules (e.g., Cueva). Captan. Of the fungicides commonly used on scab, captan has a relatively high potential to cause damage if it gets into tissue, say through small breaks caused by cold damage. Given this, it is probably best to avoid captan or at least minimize its use on cold-stressed trees. Mancozeb and Polyram. If captan shouldn’t be used, that leaves a mancozeb product or Polyram as the multi-site fungicide options. At this time of year, when risk is low, these products could be used alone. Alternatively, they can be mixed with Vangard or Scala, or other single-site fungicides. There has been some discussion among pathologists about Polyram related to cold damage. Work in NY suggests that zinc, boron and urea applied as foliar sprays may help trees recover from cold damage. Polyram contains a lot more available zinc than other fungicides including mancozeb. Whether that translates to any benefit in terms of healing cold stress is still an open question. 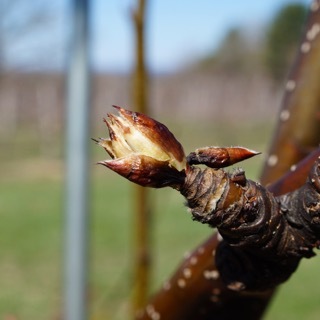 • Pruning peaches w/o a crop? Proceed more or less normally -- remember, shade in the interior of a peach tree is your enemy. Concentrate on larger cuts to keep the light shining in. Reduce tree height. Reduce nitrogen application. 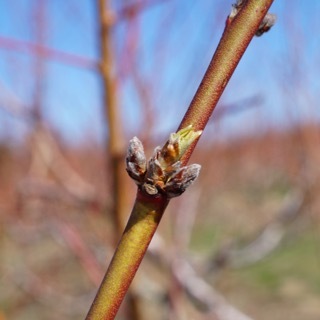 I am seeing some tip injury to shoots from the winter -- you might want to hold off pruning for a bit to see what is starting to green-up.